TKA AMUSEMENT held SHOOTOUT CHALLENGE "800" during the 1 week school term break in September. The objective was simple, shoot and score as many points as possible with a limit of 6 balls per machine and 1 chance for each finalist or team. It was a overwhelming response during the qualifier dates (7 - 9 September). Over 40 participants advanced to the finals. During the finals, those basketball finalists who were here tried their best to hit the highest scores while their fans or friends cheered them on! 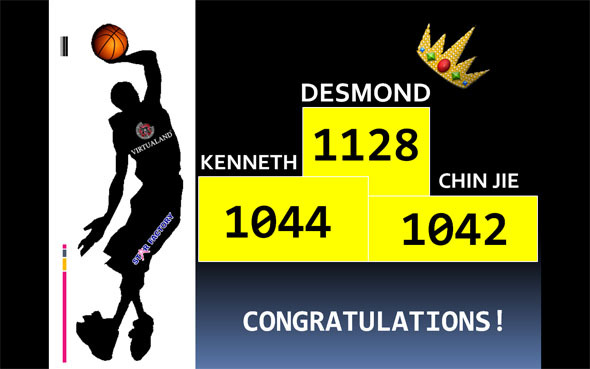 DESMOND LEE (1128 Points) - Champion! KENNETH SOH (1044 Points) - 1st Runner Up! TAN CHIN JIE (1042 Points)- 2nd Runner Up!